Nicole is my first niece and I suppose she has been my first love. The good news is that she went great at school and she also entered her university with the highest grades in the country. The bad news is she decided to study in another city, so today (I wrote it a couple of weeks ago) she’s moving there. Of course I’m happy for her and I’m sure she will achieve all her goals because she was born to be a leader. But I will miss her so, and my son will too. Her name was the first he said and he calls her all the time. I know, even if she stayed here we wouldn’t meet every day, but we would see each other more. Last night I fell asleep thinking of so many moments in these 18 years she has been in my life. I remember the first things she said (she could speak clearly since she was very little), all the naughty things she did (she destroyed a lot of stuff, usually cosmetics) and all the hugs and punches we had. She was my little sister! My son reminds me of her so much (I don’t know if this is good!). She has been such a difficult person and many times I was scared she would put herself in trouble, but she proved she can only be a winner, she just wants to torture us! Now that you will be away, I want you to know that what I always said is still the same. Whoever messes with you, he messes with me too (YOU should be good with others too!). Now I will see your face every day because your eyes are on the top of the blog. Do you remember when we filmed this makeup? I was screaming because I didn’t like anything, we even had a huge break to have dinner. I remember we finished so late at night and then I had to tidy everything, plates and makeup brushes were all over the place. My beautiful baby, I hope everything goes fine in your new life. I love you sooooooooooooooooooo! And more! I still remember when you were little and were sick in hospital you told me that you love me. That was the most beautiful ‘I love you’ I’ve ever heard! On 30th June that my religious wedding took place it was also her birthday. First, she didn’t allow me to get married on her birhday, but then she showed how much she loves me by saying ‘yes’. The least we could do was to have a small surprise for her, so my brother ordered a birthday cake. This post is already too big, so I will only say that I’m happy that today it’s my nameday! I don’t have any plans for today, but I’m having a haircut and I’m excited as I haven’t cut my hair since December (very long time!). I hope I will have time to send the gift to my Halloween contest winner today. I hope you’re all enjoying your day whatever you do! Smile! 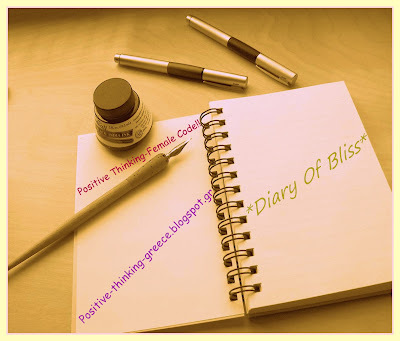 This is part of Diary of Bliss, an idea started by Katerina from http://positive-thinking-greece.blogspot.gr/ where we have to write about simple moments in our life which make us happy.